MJ Multi-Purpose Powerhead/Pump The Original MJ multi-use submersible pump and power head is built to perform and last under the harshest conditions. 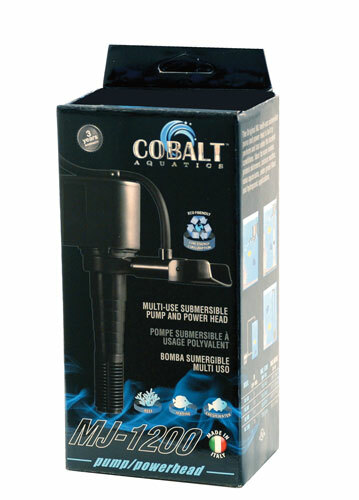 Ideal for wave makers, protein skimmers, calcium reactors, nano aquariums, under gravel filters and hydroponic applications. Includes: 1. Fully rotational output 2. Fully sealed intake for internal and external use 3. Universal intake tube 4. Adjustable hanger with cord guide and 6ft power cord 5. Adjustable venturi with silencer 6. Triple suction cup mount 7. Large intake screen for use with sponge SPECIAL NOTE for REACTOR users: The MJ pump is the perfect pump for use with reactors on reef aquariums. One thing to understand is that reef aquariums have high levels of calcium, in fact at almost saturation levels, and areas with slightly higher temperatures can have active and dramatic precipitation of calcium on parts, ie impellers and impeller shafts. In as little as 4-5 months, calcium can build up enough to stop an MJ pump. Calcium build up is NOT covered by the warranty, but is easily kept in check with routine maintenance. Every 2-3 months, take out the MJ and remove the impeller, soak in distilled vinegar for 15-20 mins, then scrub parts with an old toothbrush and work the impeller up and down shaft to break up and mineral deposits. Rinse with fresh water and re-install impeller and MJ into system. This simple maintenance will keep your MJ running like new for years.